The PA’s Restore the George plan to restore the GWB paths to their 1931 pedestrian layout is littered with bad decisions. Here’s eight. #1 – It doesn’t provide safe capacity for current use, let alone growth. 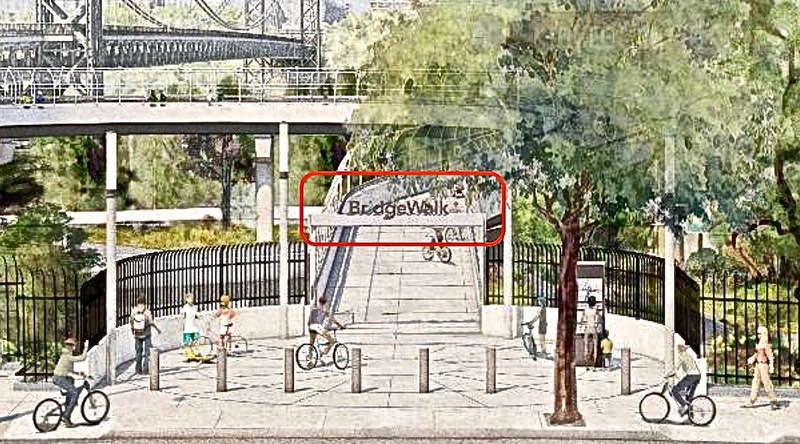 BridgeWalk: The Port Authority promises adequate capacity for all users, but the sign over the cyclists’ path says otherwise. The entrance may appear spacious, but the mile-long path quickly narrows to 7’. Source, PANYNJ Restoring the George, P. 5. Peak use across the GWB averaged 521 users per hour in 2015 – well exceeding the 300 UPS threshold AASHTO employs to recommend a 14 foot wide path. Yet the PA still plans to allocate cyclists a single 7 foot path starting in 2024. American Association of State and Highway Traffic Officers Bicycle Design Guide, 2012. Bergen County and NYCDOT are each moving forward with plans that will dramatically expand cycling on either sides of the George. In 2019, the path on Mario M. Cuomo Bridge will open. Together with the GWB, that will create a forty mile loop drawing cyclists from across the region. 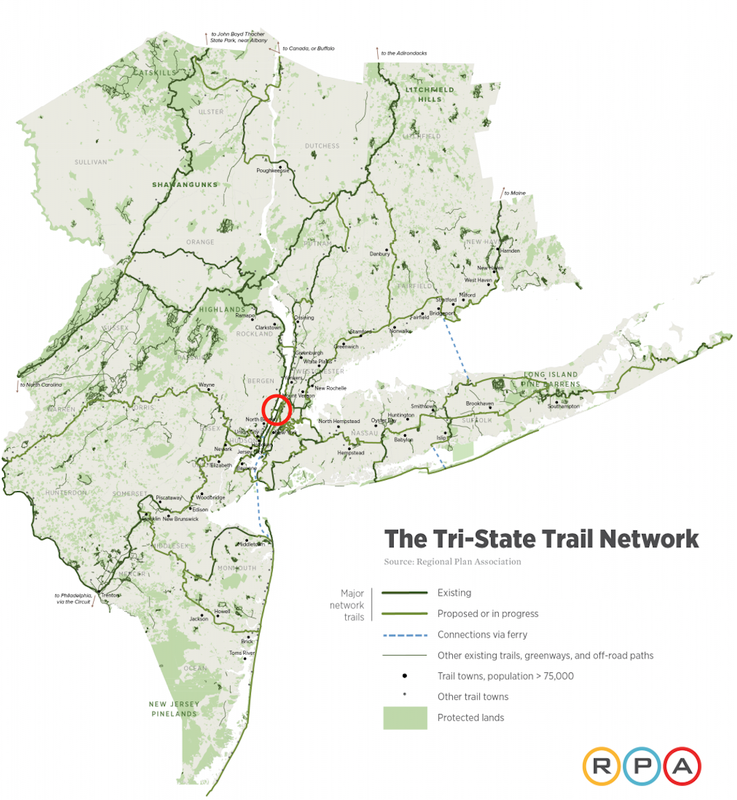 The GWB is linchpin to the nascent 1650 mile Tri-State Trail Network, so there’s ample reason to expect growth. #2 – Adding “gathering places” to entrances will create new bottlenecks. Proposed New York and New Jersey entrances to GWB North Path. Images PANYNJ. The NY entrances are at the bottom of graded ramps that cyclists will naturally descend at speed to exit and accelerate to enter. 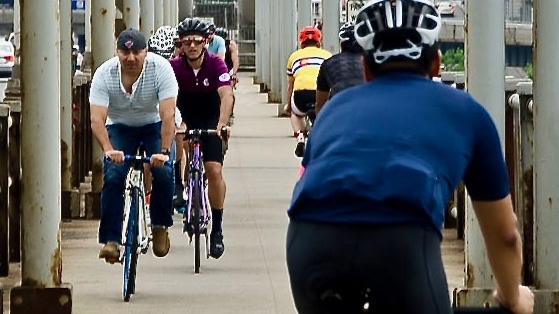 In NJ, cyclists traveling south on Hudson Terrace will have to make fast left turns against oncoming traffic to access the Bridge. At both ends, cyclists will have to ride through crowds encouraged by the PA’s plan. Predictably, they’ll be obliged to dismount, backing up traffic on the span. Manhattan Bridge on Bike to Work Day. Photo Robert Wright. #3 – It won’t alleviate stationary crash hazards. The 1931 pedestrian configuration threatens cyclists with a gauntlet of reinforced suspender cables. The PA’s plan keeps this configuration in place. #4 – Adding “wedges” to the towers will increase crashes. The four towers straddling the length of the paths comprise their scariest parts. Adding “wedges” to allow cyclists to maintain speed through a 7′ corridor will only increase crashes’ incidence and severity. #5 – It will expose the PA to frequent and expensive litigation. #6 – It won’t accommodate CitiBike. With bikeshare expanding up both sides of the Hudson, how will providers load-balance rush hours if cyclists are allocated a single 7 foot path? 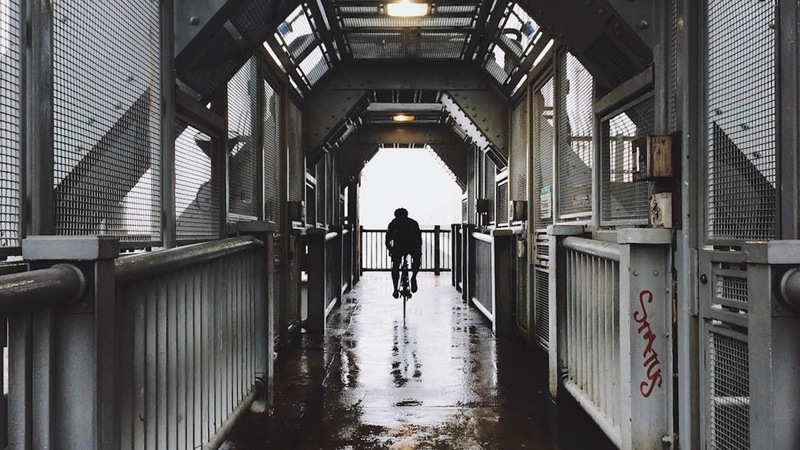 #7 – It won’t accommodate handcycles or racing wheelchairs. AASHTO guidelines encompasses tandems, trailers, recumbents and other non-standard bicycle configurations. ADA makes no provisions for bicycles at all. Handcyclist in Central Park. Wheelchair racers from ING NYC Marathon. #8 – PA’s proposed anti-suicide barriers will block the view. Generations have cherished views of Manhattan and the Palisades from the paths. But the PA’s proposed anti-suicide barriers, with its prison-like bars, would permanently, and needlessly,obstruct them. Compare the PA’s plan (left) with a bi-level arrangement that retains the view from the pedestrian path. Using a Walkway over the Hudson economic model, those views are worth $42 million per year in new tourist spending. Renderings PANYNJ (left) and Joseph Lertola (right).